«Putin will do everything to return the Donbass to the Ukraine … in order to allow pro-Russian inhabitants of Donetsk and Lugansk regions to vote and change the configuration of power in our country». He didn’t want them to be able to vote in Ukraine’s national elections. Putin has thrown all his energy into splitting Ukraine from the inside. First of all, the split of the Verkhovna Rada [parliament] to conduct new parliamentary elections. As soon as he sees that these plans are real [i.e., that Donbass will again be voting in Ukrainian national elections], he is sure to try to return the Donbass to the Ukraine, the residents there will be able to participate in them [Ukraine’s elections]. Due to the fact that the voters of Crimea and Donbas did not participate in last year’s parliamentary [and Presidential] elections, the structure of government in Ukraine has changed dramatically. The majority in Parliament has been owned by pro-European forces [the U.S.-installed government]. But if voters in Donbass again have the opportunity to vote [in Ukraine], it is clear that they will support pro-Russian politicians. This can seriously change the balance of power in the country. Therefore, once again I repeat, if Putin really feels that Ukraine could split from the inside and hold early parliamentary elections, he will do everything he can in order to restore to us Donbass. He’s not saying that Donbass does not need to be seized and restored to be again part of Ukraine’s land; he is saying that the residents of Donbass cannot be part of Ukraine; they cannot again be Ukrainians — they cannot be people who are allowed to vote in Ukrainian national elections. He is saying that those people must be eliminated if and when Donbass is restored to Ukraine. 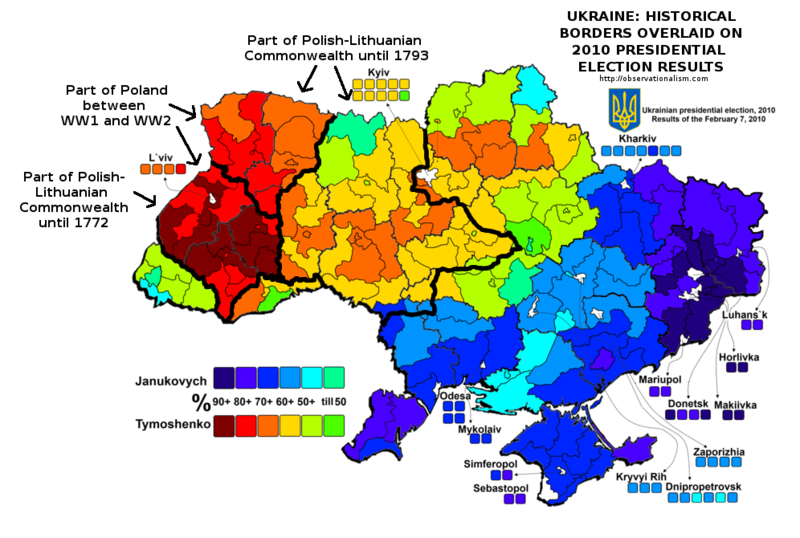 A look at the electoral-voting map of Ukraine for the final Ukrainian election before the February 2014 coup, which is the last electoral map in which the entirety of Ukraine voted for President, is here, and it shows that the Donbass residents voted more than 90% for Yanukovych and less than 10% for Tymoshenko. Donbass residents are overwhelmingly the people who placed Yanukovych into the Presidency; they are overwhelmingly the reason why Yulia Tymoshenko, the person that U.S. President Obama had hoped would win the 25 May 2014, the first post-coup, election, wasn’t already elected as Ukraine’s President in 2010 (which would have made Obama’s coup unnecessary for him, because she already wanted Ukraine to be in NATO). That map shows what Gerashchenko is talking about here: Donbass people were overwhelmingly the people who had prevented the far-right, pro-Western, pro-Gladio, rabidly anti-Russian, Tymoshenko, from being elected as Ukraine’s President in 2010. Although Obama didn’t get his #1 choice elected in the 2014 vote (because too much was known about her by then), Poroshenko was sufficiently far-right, and sufficiently compliant, for him; and what Gerashchenko is now saying is that no leader like that would stand a chance in any Ukrainian national election in which the residents of Donbass would vote. On September 1st, the U.S.-installed Prime Minister of Ukraine, Arseniy Yatsenyuk (Tymoshenko’s protégée, whom Obama’s agent Victoria Nuland selected originally to be only the interim Prime Minister until Tymoshenko would be elected as the new President, but who was kept on in office once Poroshenko won), delivered a speech in Odessa. That city had been the site of the government’s massacre (by Dmitriy Yarosh’s Right Sector) of pro-Russian (anti-coup) demonstrators on 2 May 2014, which massacre of coup-opponents had started Ukraine’s civil war; and he said there, to an audience which included the U.S. Ambassador and the Commander of the U.S. 6th Fleet, that they would all go to war together against Russia to «turn the Black Sea into a safe area and to make the Russian Federation, which illegally annexed Crimea, realize that any illegal actions will be curbed by our joint efforts».Yatsenyuk has often publicly endorsed a war by Ukraine against Russia, in order to restore both Donbass and Crimea. 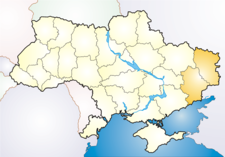 However, since Donbass voted over 90% for the Ukrainian President that the Obama Administration overthrew in February 2014, and Crimea voted over 75% for that President (see that map), the residents in those two regions would need to be eliminated, if the land is restored to Ukraine, because otherwise the residents there would vote the U.S. regime out of office, just as Gerashchenko fears. Yatsenyuk obviously knows this, he knows what got him into power, and he wants the weapons and financial assistance to get rid of those people, who, as voters, would remove him from power. On the right side of America’s aristocracy, the Koch brothers established the Cato Institute, whose Andrei Illarionove has said that the residents in breakaway areas should be simply ignored, and that the land has been stolen by Russia and needs to be retaken by Ukraine. For example: «the crimes that have been committed or are being committed by the Kremlin — stealing Crimea», must end, and the land must be restored to «the owner of that territory, namely Ukraine. Only this subject [the Ukrainian central government], and no one else, has necessary legal rights to change this territory’s jurisdiction», regardless of what the residents there think — the residents don’t have that right; they should have no say-so over who rules them. Donbass, in general, is not simply a region in a very depressed condition, it has got a whole number of problems, the biggest of which is that it is severely overpopulated with people nobody has any use for. Trust me, I know perfectly well what I am saying. If we take, for example, just the Donetsk oblast, there are approximately 4 million inhabitants, at least 1.5 million of which are superfluous. That’s what I mean: we don’t need to [try to] ‘understand’ Donbass, we need to understand Ukrainian national interests. Donbass must be exploited as a resource, which it is. I don’t claim to have a quick solution recipe, but the most important thing that must be done — no matter how cruel it may sound — is that there is a certain category of people that must be exterminated. On 20 September 2014, I headlined, «Russia’s Leader Putin Rejects Ukrainian Separatists’ Aim to Become Part of Russia», and reported that, contrary to Western news-reports which alleged that Russia’s President Vladimir Putin wanted Donbass to become part of Russia, Putin had firmly rejected the request by Donbass leaders for Russia to accept Donbass into Russia. Putin had already figured out that, in the interests of Russia’s own national security, it would be far better for Donbass’s voters to be voting in Ukraine, not in Russia. Putin had already arranged for the men in Donbass to be trained and armed to overcome the invasion by the Ukrainian government, so that some people would be able to survive there, but they’d need to stay in Donbass; they’d not be Russians. Virtually all of what the Western news-media were saying about the war in Ukraine (e.g., that Russia was trying to grab that land) misrepresented the truth. The truth was the exact opposite. The United States is pushing on with its efforts to restart the war, and to eliminate the Donbass residents. The U.S. had nothing to do with the Minsk II agreement; the Obama Administration shunned it and wants the war to resume. Obama has the support of Congress on this. Gerashchenko’s fear is also Washington’s fear: the Donbassers must be eliminated, in their view. But Putin, equally strongly, wants them to stay in Donbass, and to survive, as Ukrainians there. This is what Minsk II is basically about.